In the retail car business we all want a high percentage of customer retention. We aim to wow customers at the time of purchase, administer free or included maintenance, make their first service appointment and then we sit back and track our figures. Is it enough? Never! A good job for most manufacturers is probably around 40% for the typical used and new car customer retained. A rock star job is somewhere over 60%. We can’t just count on “good” service to keep folks coming back. What our customers want is a relationship. They want a comfort level with our people. They need to believe our pricing is fair and that there is a benefit to driving past 32 franchised and independent service centers to climb back into our service drives. Are we giving them that message? A recent study in March’s “Digital Dealer,” found that only “10% of the annual service spend of a dealer’s customers migrates to independents but dealers are bleeding nearly three times more business to aftermarket chains.” What does that mean? It means that the Jiffy Lubes and Tires Plus’s of the world are eating our lunch. There is a reason when the independents and franchised service centers send a car our way when they can’t complete a repair. We have the best trained employees around! Do we remind our guests? The same study also found that Dealers’ “loyal customers actually spend less on service annually then the loyal customer of the aftermarket segment.” We need to break that mindset that the aftermarket customer is simply a series of inexpensive oil changes and nothing more! It’s just not the case. A great way to bring customers back into the fold or keep them as our guests is Customer Appreciation Events and New Car Clinics. When I was the GM of Wade Raulerson Buick GMC our customer appreciation nights were more than just snacks and handshakes they were Community Events. They were sales, exhibitions, floor morale boosters, new product launches and the ideal opportunity to return to the RELATIONSHIP BUSINESS. 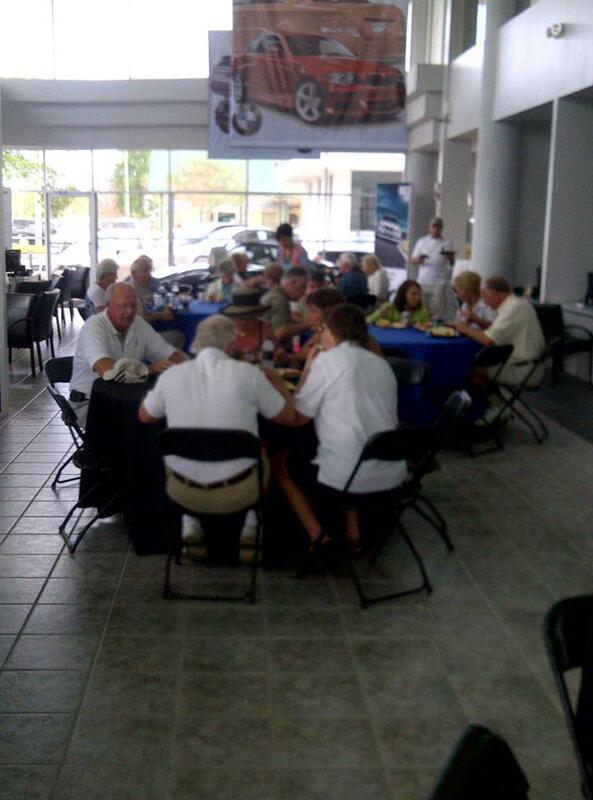 Recently BMW of Sarasota, Ford of Port Richey and Toyota of Tampa Bay all held well attended New Car Clinics/Customer Appreciation Events. c. Social Media – If you have invested in building a database --- Facebook and Twitter are free and easy ways to remind your guests what you are doing. d. Showroom and Waiting Room Point of Sale / Post notices in the restroom! That’s right folks! Your bathrooms! The logical progression of indoor advertising is quality and flexible point of sale advertising for your restrooms. Hooters posts today’s sports page – why aren’t we posting valuable messages for our guests! 2) Have them make a VIP appointment. Use e-vite or your CRM tool to track who is attending and manage reminders. 3) Give them an incentive to come in! a. Food – cater the spread to your locality and customer; don’t skimp – everyone loves to eat and they will remember a quality meal. b. Remember it doesn’t have to be a free gift or a “bribe” to get them in --- people are looking for information too. Empower your customers with information about basic maintenance or the latest technology that exists in their vehicles. They took in a lot of information during delivery. Truth is the average customer probably knows less than 60% of their vehicles full potential. d. Have a raffle for employees and guests. Make it fun. Get some sports tickets from the folks you advertise with. One year at Raulerson a guest one some prized SEC Championship tickets. We called the ticket number out three times and they were nowhere to be found. Larry found them in F&I finalizing their final paperwork. a. When guests arrive please make them feel welcome. Have a VIP check in and have someone show them around your facility. Explain the perks of your facility. We think they know --- but we only do so because we are in that facility everyday! i. Have one of your advisors man a CFNA table. Give them a coupon or bonus for sign up. Go over the program and its benefits. Spiff your writer. c. Do you have a customer loyalty card, program, or free oil change program? Let people know about it. Have a sign up table. d. Do you have a dare to compare board display to reinforce your competitiveness on the customer pay side? If so…display it! e. Build Your Social Media Audience: Take pictures of guests with new product and their family and ask if you can “Tag” them into their Facebook profiles. Setup a staging area like a Hollywood red carpet. When you are e-mailing them their picture or tagging them on facebook ask them if they would login and like your page. A five minute investment and now you have the ability to market to your customers’ everyday --- for free! Kudos to our stores who are putting on these clinics and appreciation events with some consistency! Remember each month to spend time investing in the Relationship Business. It’s at the core of what we do.